Each week, I ask someone to share their watchscreen, examining how they’re using Apple Watch, what apps are useful, and tips or tricks they have. This week, I’ve asked Jan Dawson (Twitter, Blog, Company) to share his screen. Jan has been a technology analysts for thirteen years, having founded the Jackdaw technology research & consulting firm, writes actively for Techpinions, appears on the highly recommend Techpinions podcast, co-hosts the new and excellent Beyond Devices podcast, and writes frequently at his personal site, BeyondDevic.es. His thoughts are always insightful, full of perspective from years of following the technology industry yet matched with a perceptive understanding of the human side of technology. 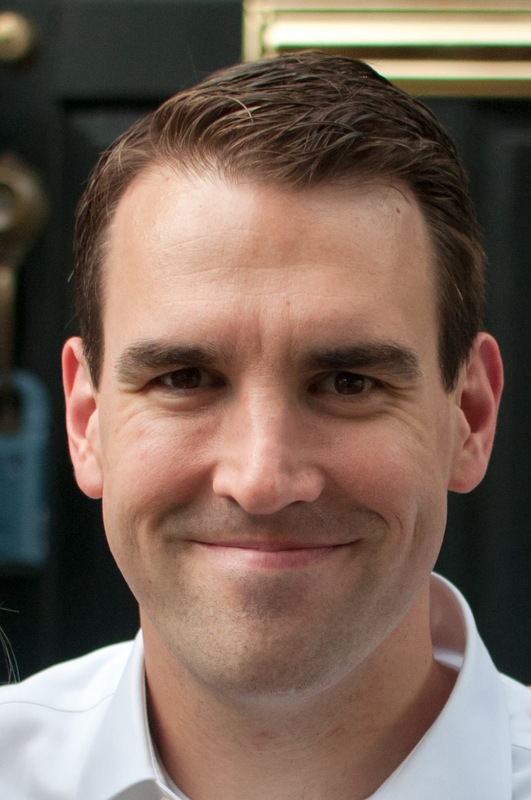 I’m excited to see his perspective on Apple Watch! So, Jan, show us your watchscreen! What watch/band combination(s) do you use and why? 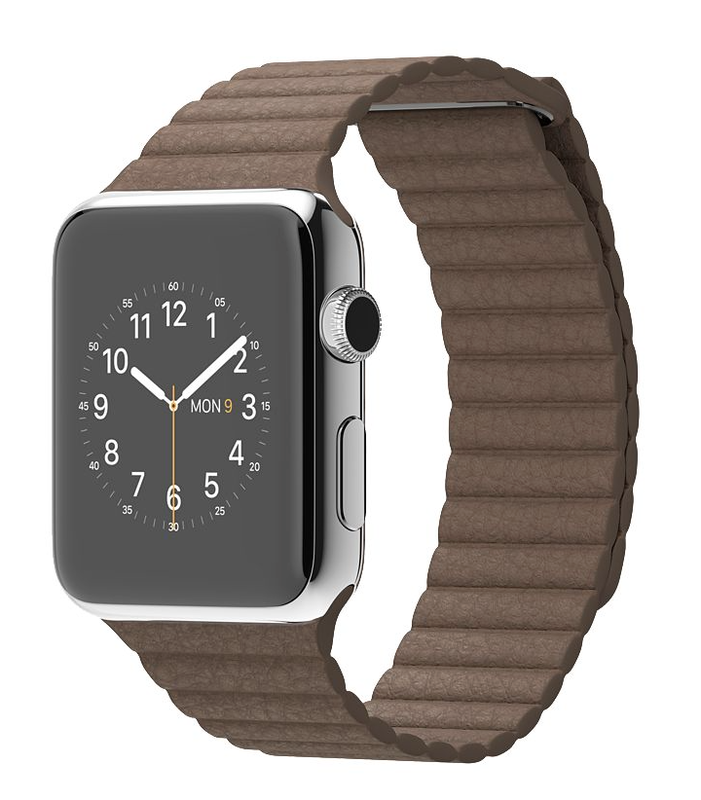 Apple Watch 42mm steel, usually with the brown leather loop, though I wear the black sport band for working out (when I remember to change it). I also have a blue leather loop and link bracelet, and I like both, but I find the leather loop the best combination of stylish and comfortable, and it’s easiest to stick with one main one. How is Apple Watch fitting into your life? It’s remarkable how well it’s fit in and how quickly it’s become a very natural part of my life. I use lots of devices (most of them made by Apple) in my life already, and it’s just become another one of those that I use very regularly and get a lot of value out of. It’s allowed me to keep my phone in my pocket more often while also very effectively replacing my analog watch with something much more useful. What watch faces & complications are you using and why? I settled almost immediately on the modular watch face, even though instinctively I wanted to go with one of the analog style faces because I’ve mostly worn analog watches for the past twenty years. I very quickly figured out that the modular faces provided much more information on the screen at once while still preserving the time nice and big on the watch face, and that’s the perfect mix for me – I’m actually really looking forward to when third party complications make their way to the watch. As for complications, most days I use the time, date, battery life, activity rings, calendar, and weather complications. On Sundays, when I don’t need to worry about meetings or other things on my calendar, I use a slightly simplified version of the modular face, with the larger date complication taking the place of the calendar. 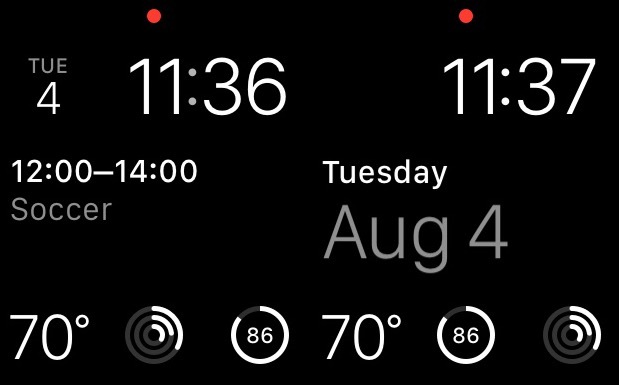 The challenge with the modular face is that it has these specific slots for complications at specific sizes, and really I’d like to just have the time, date, and maybe the weather on that face, taking up pretty much the whole screen. But this works fine for me. What Glances do you use and why? I have various glances installed but I hardly ever use any of them, because they’re always out of date and take way too long to refresh when I launch them. Very occasionally I’ll use one if my phone is charging and out of reach or if I need to use my phone for something else while checking something like a sports score, but that really is the exception. I can see myself using Glances much more with WatchOS 2, when they will hopefully load much more quickly. The word “glance” is really a misnomer at this point. What notifications do you receive on Apple Watch and why? Email, Twitter, voicemail, Facebook, and when my wife posts an Instagram picture – I think that’s it. When I first got the Watch, it prompted me to really pare back my notifications on both my phone and the Watch, because I didn’t want to have my phone still buzzing in my pocket for things that weren’t coming to my Watch. So I ditched a few of the apps I had notifications for entirely, and set a handful to only display on my iPhone lock screen without buzzing or beeping. (I also turned off the ringer on my phone and it now stays permanently in silent/vibrate mode, as does the Watch). How are you using Apple Watch’s health and fitness features? The funny thing is that I wasn’t in the market for any sort of fitness tracker or anything – I used a Fitbit for a period of time a couple of years ago when I was trying to lose weight, but quickly found that I could predict pretty well what the day’s numbers were going to look like, and the fact that it was in my pocket meant I hardly looked at it from morning to day’s end. However, the Apple Watch’s use of the circles, which make goal completion very obvious, and the fact that I have that complication on the Watch face throughout the day means that I’m constantly reminded and fairly motivated by it. I’ve found myself prompted to do better at exercising again after a period of getting out of the habit, and both my wife and I took daily morning walks together for a while after we got them (she’s now quite heavily pregnant and has had to drop out). I get some real satisfaction out of hitting the various goals each day, with the occasional extra boosts from the extra achievements and awards. How are you using Apple Watch’s communication features? The only feature I really use is the text messaging feature, and usually only if I’m driving or walking or otherwise unable to whip out my phone to type out replies. I’ve found Siri on the Watch to be very good for the most part, and frequently dictate responses to texts that way. What I don’t use is the Digital Touch stuff – I’ve barely even opened that functionality since the first week I had the Watch, and when I do it’s usually to demonstrate it for other people. I thought I might use it with my wife, but we don’t use it at all. How do you organize your apps and why? Like the Glances, I’ve found most of the apps too slow and too lacking in functionality to bother with. So I haven’t bothered to organize my apps at all, other than to try to squeeze them into a somewhat compact shape on the app screen. What Apple Watch apps are you using most and why? The only apps I use regularly are the Workout app, Messages and Activity (see above), and occasionally Twitterrific, for dictating replies to notifications. I have lots of other apps loaded, but use them only very occasionally. What apps do you think best leverage the uniqueness of Apple Watch? Why? I’m still waiting for apps that really do this well. Twitterrific is probably the one that I use that does the best job for now. What apps have you discovered that others may not know about? I really haven’t – I’m hoping WatchOS changes things, because even though I’ve gone hunting a few times in the App Store, hoping there will be some new stuff that sounds compelling, I haven’t found anything. What app would you like that you don’t have yet? I’d like Tweetbot – which is my default Twitter app on the iPhone, iPad, and Mac, to have a Watch app, because at the moment I’m using Twitterrific for notifications and quick replies from the Watch, but Tweetbot everywhere else, which is a bit awkward. I’d probably like Facebook Messenger for the occasional times when someone sends me a message and I just need to send a quick reply. There are also a few apps that do exist but really don’t do a good job yet, and I’m hoping that WatchOS brings some big improvements in functionality and performance. 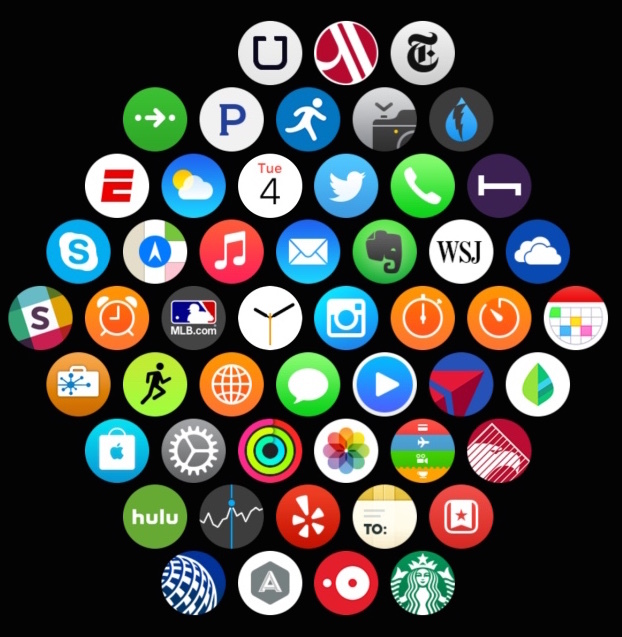 What are your thoughts about Apple Watch as informed by your background as a technology analyst? I’ve written quite a bit about the Watch here and there. I think it’s a fascinating new product (and product category) and I think Apple is just barely getting started, yet it’s already moving very quickly, with a major update to the OS within the first year (possibly the first six months) since launch. But I think Apple and the rest of us have little idea of how it’s going to evolve or how the market will ultimately react. I’ve mentioned WatchOS several times here already, but I think it’s going to be a huge deal for the third party app ecosystem, which in turn will be huge for the future success of the Watch. We’ve seen a fairly slow start out of the gate for sales, but I suspect sales will ramp up significantly in Q4 this year with new apps and the holiday buying season. Thanks Jan (Twitter)! If you’d like more, check out his blog and the Beyond Devices podcast. Check back next week for another watchscreen or look now at previous watchscreens. You can subscribe to this site via RSS, Tumblr or by following MarkDMill on Twitter. In this section, I recommend an app that I think belongs on anyone’s iPhone or Apple Watch. Today’s is Overcast, the best podcast player in existence. Check out my recommendation to see how it has saved me nearly an hour of time a week and check it out in the App Store today!